All in the Realms of Light are true, faithful and constant: utterly trustworthy and straightforward. You may be sure that this power for good, united in one desire and one leader, which is the Living Word of Truth, shall prevail and shine away the darkness. Service of Mystical Communion with Christ. The objective of this site is to help all who are seeking deeper meaning and purpose in life than is immediately apparent when we experience the world around us with our bodily senses. This world of time and place is an illusory realm, occurring in our mind; a dream, just like a night-time dream. As Albert Einstein said, ‘A very realistic dream, but a dream nevertheless.’ We are now at the most crucial and exciting time, or moment, in the history of humanity and of time: the moment of Awakening from that dream – a dream of separation from the Light of Creation, from the Creator Spirit Who is the very Source of that Light; from our true, undivided, One Self; and of spiritual darkness, guilt, fear conflict and ‘death’ – to the ineffable reality of our eternal Life and Oneness in the Heart-Mind of the Creator Spirit, our heavenly Father; Papa God. Conscious awareness of this unfolding event began for me in 1967, when Jesus manifested to me in his glory, beginning a decades-long, still ongoing journey with him, during which I have placed myself within his care, guidance and protection, and have (mostly!) been following his lead. He told me he had come to lead me back to God, and that he was (is) my Guide to eternity. He won my absolute, undying trust and devoted Love for him from the beginning and ever since, revealing many proofs of the authenticity of his all-empowerment-by-perfect-Love. In Truth he is – or would gladly be if/when we are willing to trust him enough to follow his leading – the Guide of us all, his brothers in the Sonship of God. His purpose is to lovingly, gently, caringly restore us all back to awareness, remembrance, of the unutterable bliss that is Oneness with him in the Father Creator … the fully Wakened eternal reality of our Being as the indivisible extension of God that we are. There is a priceless ‘mechanism’ by which he can, and will, restore us to spiritual Wakefulness – in response to our desire. This mechanism is a devotional Service of Mystical Communion with Christ. It was brought into this world of time and place from the Realms of Light, under Christ authority, through Olga Park (1891–1985), who became my spiritual mentor in 1965. This Service helps us to focus our heart and mind on the eternity of Heaven that is our true and only Home, in the endless bliss of holy (i.e., whole, complete) communion with our Father Creator. Jesus was constantly in that state of awareness and communion during his earthly mission two millennia ago. Heaven is a state of perfect Love, peace and joy – qualities so far beyond ‘human’, finite understanding that words cannot convey the meaning or experience of this state of Being. Only can It be experienced by first desiring It and then choosing to join, become – again – at One, unified with It. When Jesus manifested to me (in response to the earnestness of my desire) in his celestial glory on January 24, 1967 I espoused my life and entire being to him and his Great Rescue Programme. This espousal is a joining of minds that share a common desire, purpose and intent. Minds can only join by communicating. True communication is solely Loving. All the rest of what is mistakenly perceived as communication, but is loveless, is a perverse, insane endeavour at breaking communication. The six o’clock news will confirm this. The loftiest nature of communication is mind-to-mind communion, and when its sole, focused purpose is Loving, healing, joining, it is Holy Communion. In 1967 I began practising this mystical Service of Holy Communion with Christ. This has brought incalculable benefits in the form of miracles, astonishing synchronicities, blessings, wise counsel, teaching and explanations of esoteric, mystical, eternal reality, much of which is at variance with orthodox religious doctrines and dogmas about God, Jesus and Heaven, or eternity. All this was within a context of unconditional Love, infinite patience, gentleness, caring, lightness of heart and joyous, treasured humour. Many of these experiences of his visiting with me, and his words of guidance and explanation about eternal Truth and reality have been shared in the weekly Messages of Encouragement (MoEs) that I was inspired to begin writing in 2006, along with their accompanying Diary of a Christ Communicant (DCC) records. Thirty eight years later I came to A Course in Miracles and instantly recognised that the same, real, living Jesus, of Love and Light, peace and joy, wisdom, gentleness, fun, caring, guidance and protection, with whom I had been in blessed, conscious fellowship and communion since 1967, was the author of the Course. The Service of Mystical Communion with Christ accords, harmonises entirely with A Course in Miracles. This is hardly surprising since both come under the same authorship: Jesus of Nazareth, the Anointed Messenger of the Holy One. During 2018 I was inwardly prompted to make some adjustments to this Service and share with, make available to, all who sincerely desire and have a yearning will to establish their own home sanctuary of Holy Communion with Christ, and participate in this devotional, Mystical Communion Service. It has long been my heart’s desire to share this with, extend it to, all who desire, above all, to become like Jesus (1 John 3:2) … until the separation consciousness – of judgement, guilt, fear, conflict, sickness, pain-and-suffering and ‘death’ – is no more. I am very glad – overjoyed, in fact☺– to advise that these inwardly-inspired adjustments are now completed, and the Service of Mystical Communion with Christ is now uploaded onto this website, that all who so will are freely able to access, participate in and benefit from it in their own home, for their Help in spiritual Awakening to remembrance of the Oneness of all – with, and as guided, led, inspired, tutored by Jesus – as Papa’s one, beloved, reunified Son. In order to obtain optimal help in the understanding of, and resonance with, this devotional Communion ritual it is strongly recommended that these 3 sections be read through fully at least once before attempting to perform the Service and experience the fullness of its spiritual benefits. 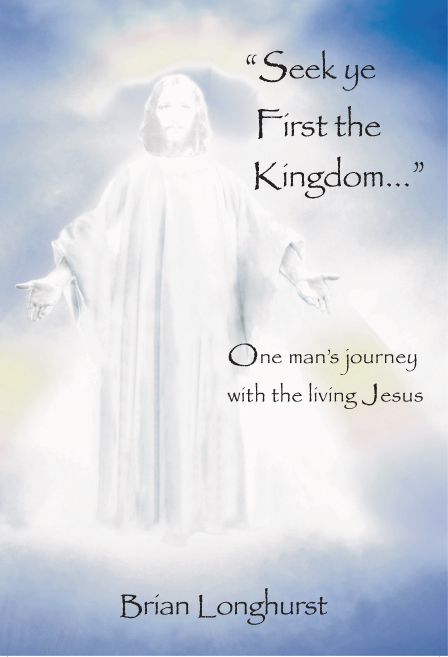 As a result of my experiences from Jesus’ leading I was prompted to write my first book, “Seek ye First the Kingdom…”. It describes the relationship with him that he so lovingly cultivated between us – and to which I so gladly responded and reciprocated. This book can be considered as helping to open the door to acceptance of the reality and accessibility of the eternity that is Heaven, and the Loving, benign care, guidance and protection that is freely available to us all, here and now, from There. Please click here for more details of this book. Subsequently, the titles were given to me from Spirit of a further six books that it was intended for me to write. The total of seven volumes in this ‘Kingdom’ series equate to seven progressive steps in the spiritual Awakening process from the dream of separation – the hell of time and place – to restoration to the eternity of Heaven. The sixth in the series will be released at Easter 2020 and the seventh at Easter 2021. All are warmly invited to contact me with any questions arising from what you find on this site, or to share any mystical experiences that are pertinent to the great desire and purpose of Jesus for the elevation of ‘all who will’ to the living awareness of what he calls ‘the Kingdom of Heaven’. Boundless Love and blessings for inner peace, joy and fulfilment of your heart’s desire for spiritual Awakening under the leadership of our beloved elder brother, Jesus.